As far as diplomacy goes, last Sunday's summit in Seoul between Korea, China, and Japan appears to be more about tactics and communication than about strategy and issues. 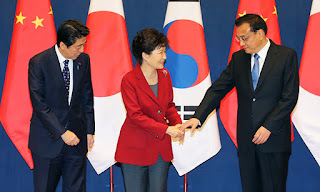 Yes, trilateral summits are back, and in a more formal manner than last year's distant encounter of the third kind between Barack Obama, Shinzo Abe, and Park Geun-hye in The Hague (see "The Tripartite Summitulacra"). But that 56-point joint declaration* is pointless. And fundamentally, nothing changes. And body language keeps betraying clear rifts, like on this Yonhap picture where Shinzo Abe struggles to get the attention of a Park Geun-hye - Li Keqiang couple that makes good eye contact, but where Korea is eager for more affection from a China obviously calling the shots. China's top man is not even on the picture, because this non-event is not at Xi Jinping's level, even if he does go well with Park, and even if he warmed up a bit with Abe recently. That last bit was actually one of the countless reasons why Park was forced to accept a summit with Abe. In order for her to save face, it had to happen in Seoul, and with the alibi of a trilateral moment, and with a promise that some progress would be made regarding the 'Comfort Women' issue. As if Park were the one who reconciled everybody! As if Abe intended to make any move in favor of the victims of Imperial Japan's sexual slavery system! As soon as he came back to Japan, the revisionist PM naturally confirmed that no agreement would happen during the proposed time frame**. Abe will play the next summit on his home turf, and will as usual, as we frogs say, "try to drown the fish".